Trevor Knowles isn’t a complex individual. He doesn’t give long-winded answers to make himself sound fascinating. In fact, when I asked him who he’d like to be stuck on a desert island with, he said with absolute certainty: “Someone who can cook really good.” He listens to Waylon Jennings on his iPod and his Dad is his role model. However, Trevor remains a captivating presence. His personal history better explains his simple life approach: he grew up in a rodeo family, with his father and uncle setting first rate examples. He carries with him that intimate understanding of cowboy life and the humble appreciation for all things relating to the outdoors. 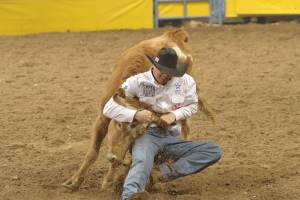 Nevertheless, it wasn’t until his early twenties when he decided to give rodeo the spotlight in his life. And even then, it wasn’t an easy decision. There were challenges he would have to overcome. But it’s his staying power that makes him stand out. Perseverance and determination are words easily associated with the 34-year-old Oregon native. 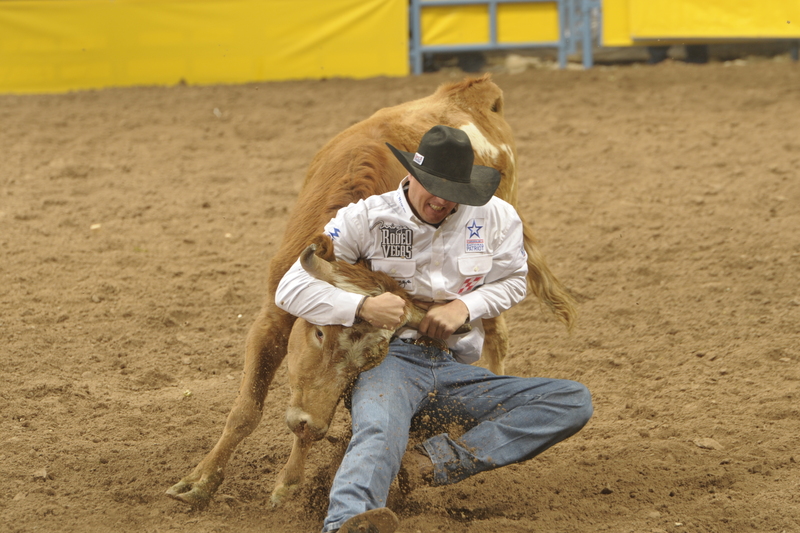 Steer wrestlers are built tough. In that way, Trevor is no exception. While it takes stamina and a durable spirit to continue in a sport that can be hard on even the most resilient body, it also requires a sturdy mind and a whole lot of patience As with any occupation, be it a professional athlete or a courtroom attorney, character building events are constantly shaping who we are. Those events, the ones out of our control, the ones where we panic for a split second before anything else happens – those are the events that have made Trevor into the man he is today: the man who is heading to The Wrangler National Finals Rodeo for the eleventh year in a row. How does an athlete prepare for the eleventh year at the top of his game? He’s definitely ready to go at this point. His smooth voice and relaxed laughter reminds you he’s been here before. He knows what he’s riding into. He’s seasoned and relaxed and has spent the better part of his adult life preparing for moments just like this one. We think you are too, Trevor. Heather Haines is a freelance writer living in North Carolina. She spends as much time as possible in the barn and is constantly on the lookout for her next favorite pair of boots. Heather may be contacted at ccaheather@yahoo.com.